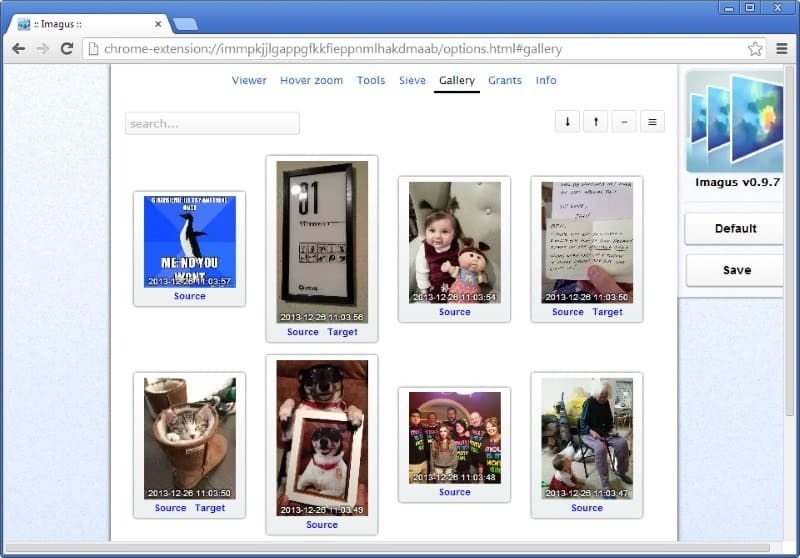 Hoverzoom became a highly popular browser extension right after its creation. It displayed larger versions of images that you hovered over, so that you did not have to visit the linked websites to do so. As you can imagine, this saves a lot of time on sites such as Reddit or Imgur, where images get posted like crazy. Back in March 2013 we noticed that Hoverzoom was running a script in the background that the company claimed was used to "detect unused domain names and submit the results back to the owners". Some days ago, things got a lot crazier. A thread on Reddit claimed that Hoverzoom turned malware, as it was seemingly injecting "malware scripts" into every page visited in the Chrome browser. This script is not malware. Your personal data was not collected. There is no need to change your passwords. You can read the full response on the website. In regards to what is being collected he states, that form data is collected anonymously for marketing research purposes only. Hoverzoom injects code unto some or all of the web pages you visit while the extension is running. Hoverzoom modifies "certain Amazon links" on all websites you visit, adding its own affiliate ID. It sends domain misspellings to another third party website (advisormedia.cz). All monetization schemes are active by default. On December 18, version 4.28 was released that removed the script again that was added on December 17. Hoverzoom at the time of writing has been removed from the Google Chrome Web Store. According to information on the site, it was removed by the author and not by Google. If you used Hoverzoom until now, or want to use it but cannot because it has been removed from store, you may be interested in alternatives. One Hoverzoom alternative is Imagus. The free extension for Google Chrome works identical in many regards. Once enabled, hover the mouse cursor over an image to display its larger version -- if available -- right on the screen without having to leave the page you are on. The extension does not work on all sites, just like Hoverzoom. but it supports many. Especially image hosting websites, but also popular sites such as Facebook, Yahoo, Twitter, YouTube, IMDB or Flickr to name a few. What is also interesting is that it adds lots of handy features and shortcuts to the whole process. Make the extension work only when you hold down a key, or disable it when you do so. Preload images for faster access. Use shortcuts such as Alt-Shift-D to suspend the extension for the domain for the session. Define where the image pop-up is placed on the screen. That's not all however. You can send any image you come across to the built-in gallery using the g shortcut. The gallery lets you browse all images that you have added to it which can be quite useful if you want to keep track of certain images that you like. All images added to the gallery contain a source link, and if available, a target link as well. That is still not all though. 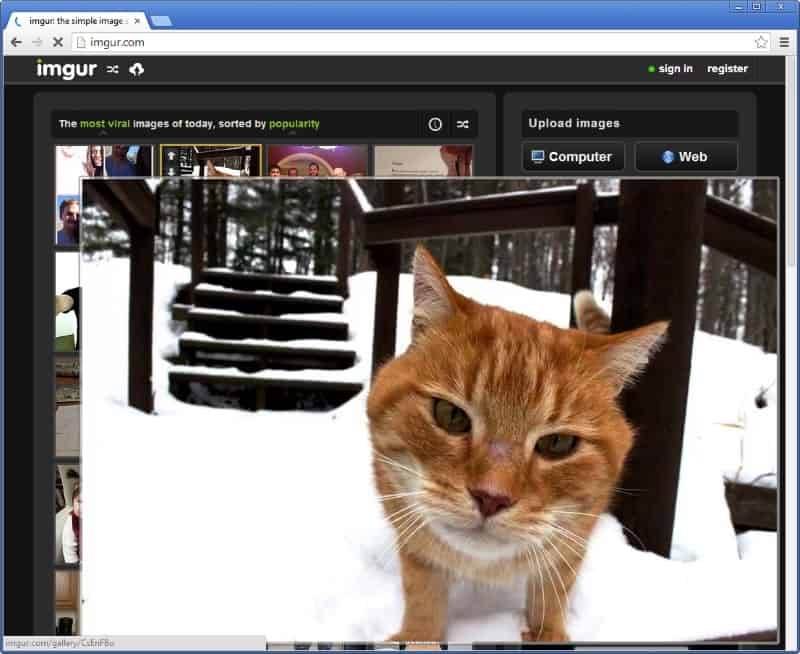 You can flip, rotate and fit to height or width using shortcuts, send images to hosting services, or define viewer related features such as zooming with the mouse wheel, adding image borders or defining long press actions for the left or right mouse button (for instance to fit to screen). The controversy surrounding Hoverzoom highlights the importance of monitoring installed browser extensions. Scripts like NoScript for Firefox make sure that connections cannot be made by extensions automatically, and it is highly suggested to use something similar for your browser to make sure that your information are not grabbed by installed extensions. The whole incident had disastrous consequences for Hoverzoom. Not only did the extension receive hundreds of 1 star ratings on the Chrome Web Store, it was also removed from it by its author, likely to avoid further damage to the reputation of the extension. Chrome users who are looking for an alternative should take a look at Imagus, as it is quite the fine piece of software. Eh, Chrome. As a Firefox user I’ve been using the “Thumbnail Zoom Plus” addon for this type of thing, but have recently replaced it with the “Mouseover Popup Image Viewer” userscript as I find it even more intuitive to use. The script is also available for Chrome with Tampermonkey. I was really getting used to HoverZoom. But what they did was unethical (if it is true, especially changing the URL to fit in your affiliate ID). Imagus does look like a good alternative but there is room for a lot of improvements! Smoothgestures does the same stuff, tracking your activity and modifying webpages to inject its own ads. I (and many others) submitted complaints to Google, but the addon remains in the Chrome web store. Google basically doesn’t police its addons at all. They do not care. In chrome (with extension Tampermonkey) takes up much less memory. Yeah, I mentioned the same script in my post. It’s a great script. As far as extension doesn’t inject ads to cover Google’s ones that advertising company won’t do anything about it and this is the reason -I bet- why they going to ban side loaded extensions any moment soon. In terms of spyware browser extensions are the best target ever – cross platform,hard to monitor, easy to install and effortless to use. Thank you for the information. It is a great source to keep oneself informed and up to date of the latest developments. Thanks for the info. Hover Zoom was one of my favorite extensions. Of course this is not the first time an extension has gone rogue – and it doesn’t matter how reputable or used one is, so don’t feel “safe” if you’re using a well-known extension. For example, and I had almost forgotten, but there was a time when Noscript was mysteriously connecting to unknown servers, and when you tried to block this access using Noscript .. well the extension just up and ignored its own code! I still don’t use Noscript (preferring Yesscript instead). To really see what is going on without going through the script code, just monitor your network connections either through your router (if it has a network activity log), or using a software solution. If you see web addresses / sites that are unknown, do some investigating. Thanks! I wasn’t aware of the script injections! How do I change the language in Imgus? The options in my native language mean absolutely nothing to me, I want to get rid of the annoying animations. Using Safari 6.1.1…installed Imagus but there are no preference options when selected….just opens a blank page. Hopefully development for Safari will be ongoing. Really need to get the word out to Safari users to uninstall Hoverzoom and for Apple to get it off their extensions page. I tried Imagus extension and it didn’t work reliably on Facebook (for example there was an album added with it’s story on timeline and zoom only worked on the biggest image, not on lower 3). Also there was no option to turn off Animations, maybe setting delays to 0 would work, but it’s bad UI for normal users to not have this option. I installed Hover Free and this works reliably so far on all the images. As of current the version is up to 5.5 and there is no script injection anymore since 5.2 as too many people complained. The reason why I like Hover Zoom is not really for the zoom capability, but for the fact it has added the ability to save the image with a single key tap (default S which in Facebook should be changed to another letter because it sometimes launches a FB shortcut to share a page) especially useful for pages that disable R clicking images to save. And it is simpler and faster than having to R click to save an image. Scratch that… as of today’s update (December 2nd, 2014) version 5.6, they/he added the redirecting to the advisormedia site again. Though according to advisormedia, no personal knowledge is being tracked, all they do/are is a Passive DNS replication, which tracks and reports back to the author what and where we click. Data mining basically for what ever purpose. I’m not entirely happy with this, but it seems harmless. Its like buying a car and having the dealer install a GPS tracker to see where we go… not sure if it is any of their business like this Hover Zoom script using Api.Advisormedia.cz site to mine our data. I’ve long been using chrome.Sometimes its all a matter of preference and brand loyalty to an extent. As of about November 21, 2015, Google has disabled Hover Zoom in the Chrome browser. You can reactivate it again (and probably play activation ping-pong with Google every time your browser is updated), but I strongly suggest getting Imagus, which is a much better extension.